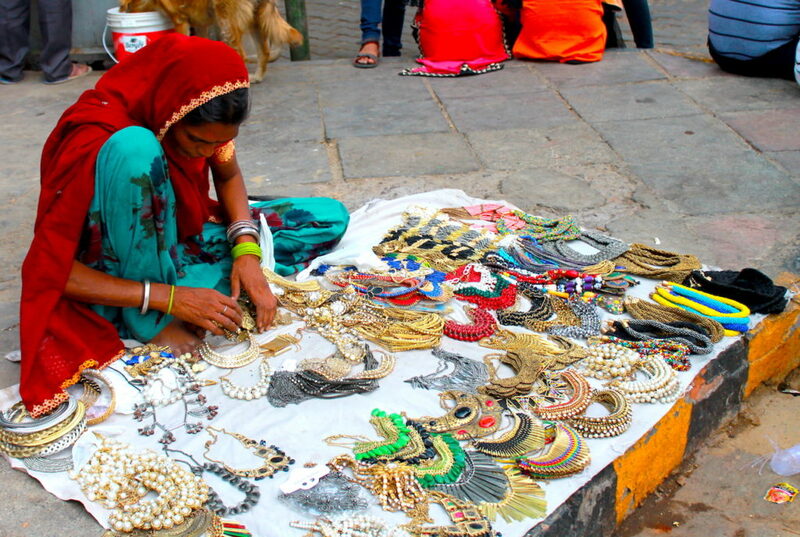 If Mumbai is the fashion capital of India, then Delhi definitely has to be shoppers delight. 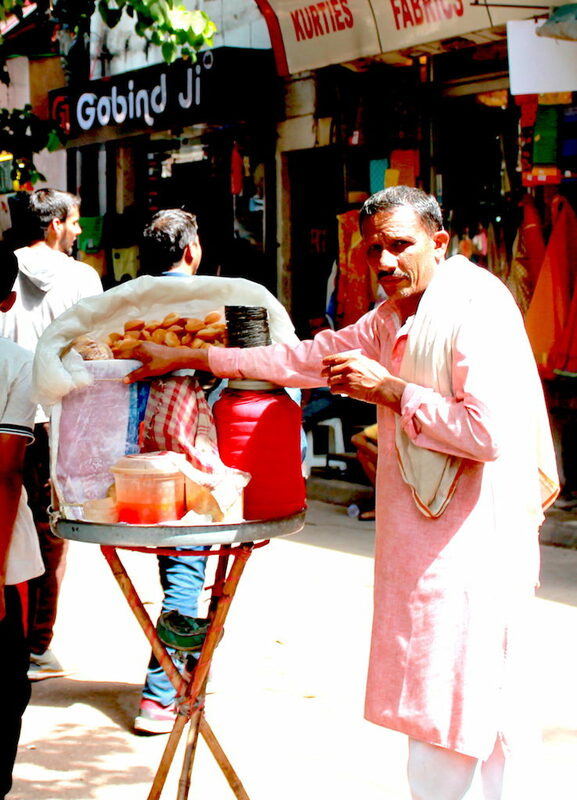 A paradise on earth, Delhi offers you a range of markets according to your needs. 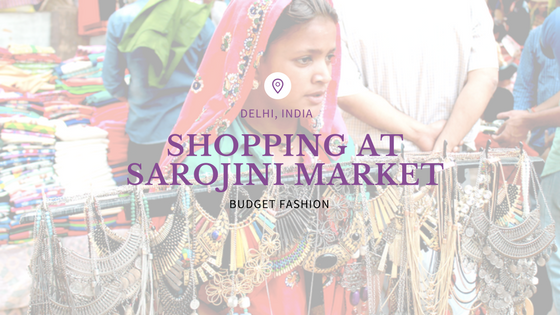 We know it is not always plausible to visit Mango, Zara and Vero Moda for fashion needs and hence, *drumroll please* Sarojini market comes to your rescue. It a fashion paradise for girls and hence you will see thousands of women flocking there each day. 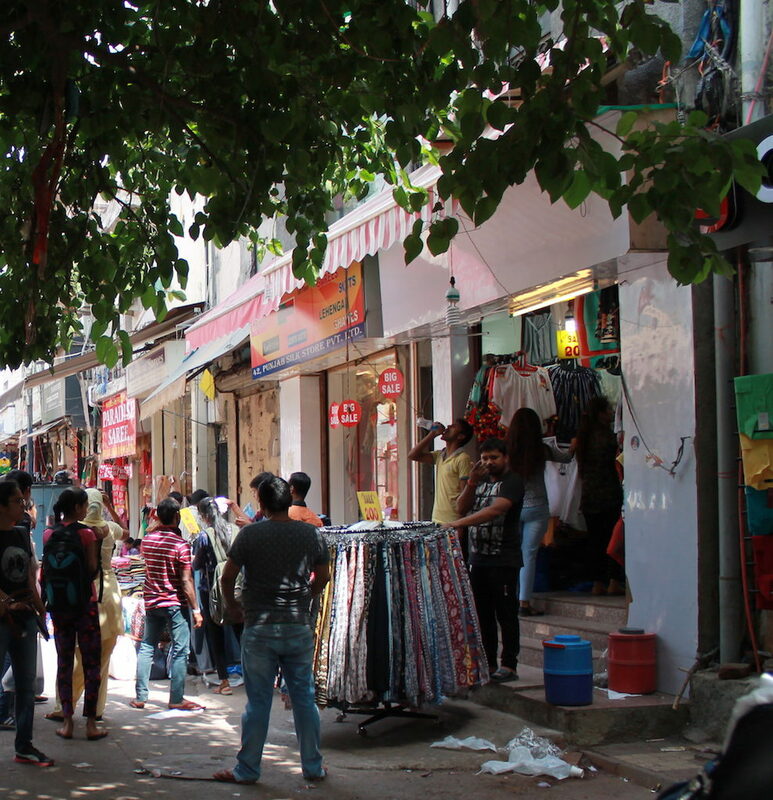 Sarojini market is a circular with two main lanes and every other lane connecting the two. Its like a circular waffle, may be!? If you viewed it from the top, it would probably looked like tic tac toe. Now, you got to remember where you started or you will keep coming back to it without realising. You can remember the gate numbers or a shop or two so you recognise when you bump there again. Also, if you can take someone along with you who speaks Hindi it would be easier for you. They tend to raise the prices if they know you are not from Delhi. 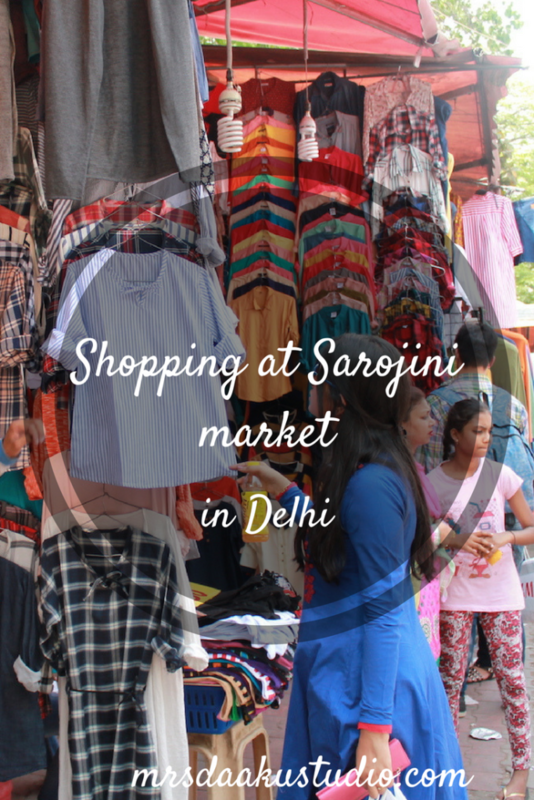 You definitely need to have a lot of energy to shop at Sarojini market an entire day with the variety if offers and thousands of people walking past you, pushing you sometimes, pulling you other times. 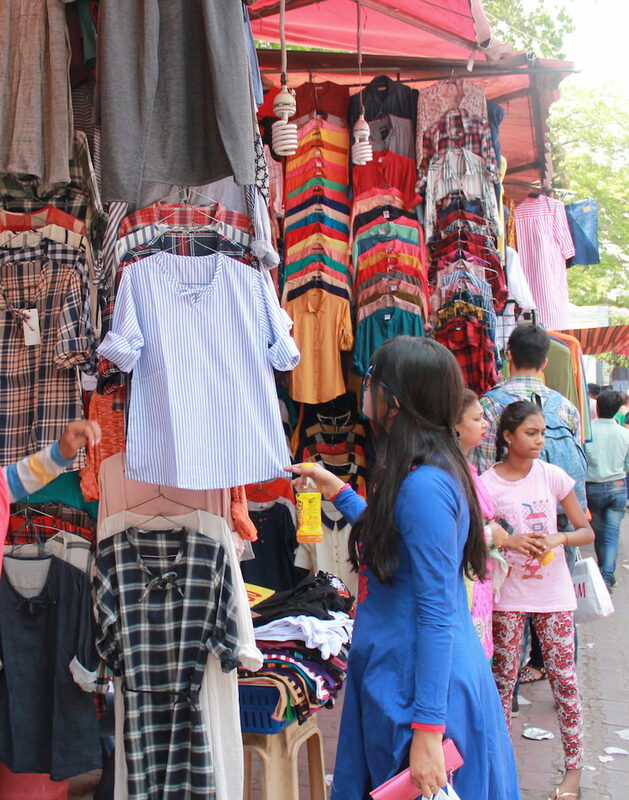 Me and a friend of mine (and a blogger) Astha reached Sarojini market around 1 pm. It was really hot. But, our spirits weren’t dampened as the thought of collecting the precious styles kept running through our minds. We decided to shop until we drop in my words; and shop until our purses are empty in Astha’s word. So, lets see what all we did. We started to look around and shop. In no time, we stopped by to buy loose fitting mustard colour pants with a ribbon on its waist. While the shopkeeper confidently quoted 450 INR as the price, we had no qualms while giving him counter offer of 200 bucks. He threw some tantrums initially – nahi milt hai (won’t get at that price), kahi nahi mileage (won’t get it anywhere), nahi dena (won’t give) and alike. We decided to move on and stepped out of the shop only to be called again. He had agreed to give the pants at INR 200. Win 01. Hi-fi to each other! 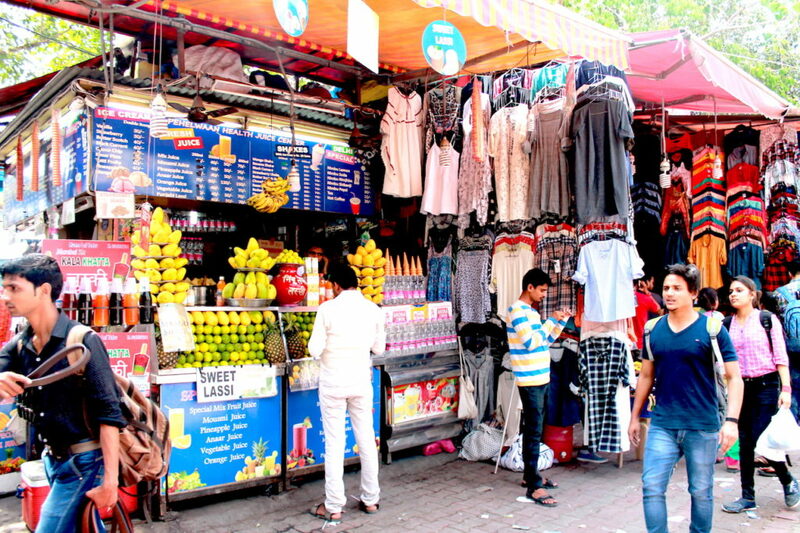 We had a stylish mustard coloured pants in 5 minutes of having entered Sarojini market. 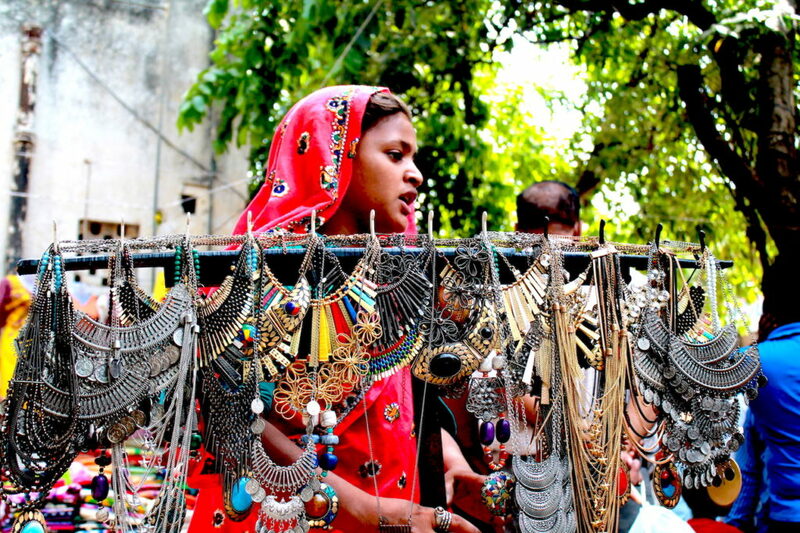 As we walked by, we spotted a shop with beautiful jumkis, earrings and bangles. We flocked around it like birds, shuffling through the variety and deciding which ones are the best. We bought 7-8 pairs of ear pieces, each of them worth 50 INR (quoted at 100-150 each initially). Win 02. And it had begun! The shopping mania. We did not stop after that. We bought dresses, pants, top, neckpiece and earrings. I was looking at various home decor options as well for my new house in Delhi but wasn’t sure of carrying it back in the metro. So, did not buy it. However, you do get beautiful and antique looking lamps, shades, coasters and other decor stuff. You also find really nice curtains, cushions and other linens. I remember accompanying one of friends to Sarojini market in winters to buy a quilt. It costed her around 300 INR and it lasted her entire Delhi winters. It is still intact! That time, we had also bought a chic looking peach jacket for 400 bucks, a couple of sweaters and overcoats for 15-250 bucks each and a couple of boots which costed around 500-600 each. I wore them entire winters, washed them multiple times and dry cleaned them once. They are still the way it were. Win-win! Next winters, I will go once more and add more to my sarojini collection. Now, back to my visit with Astha. Tip 2: Bargain shamelessly! Don’t feel tacky or cheap while quoting 1/2th to 1/4th of the price. Astha shot an introduction to her new video on sarojini market and after that both of us forgot to click any pictures or take any videos. We were totally into the shopping and finding all the styles we wanted. We pretty much ended up buying similar stuff. 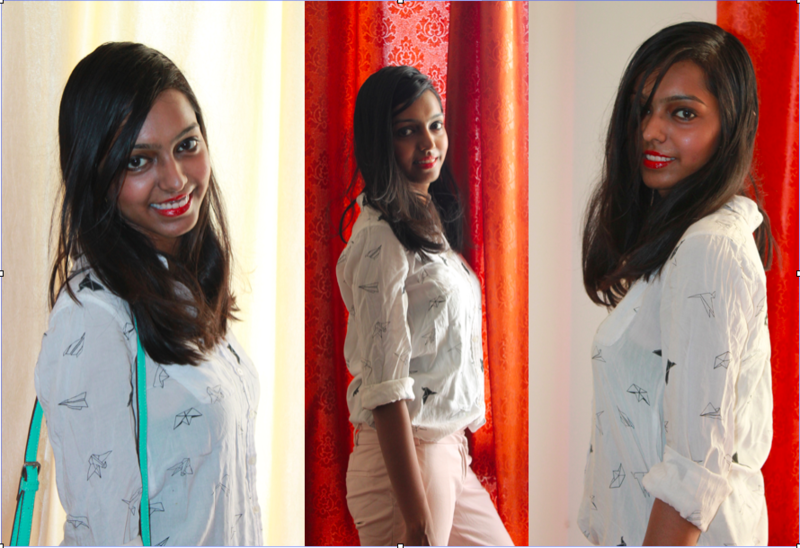 So, you can keep tuned with smalltowngirl for a video on sarojini market and know what all we bought. You should definitely subscribe to her channel and be tuned with her amazing DIYs. There were 1-2 shops we entered who weren’t ready to reduce the prices so we decided to not buy from there. You get similar stuff at other places where it can fit your budget so do not think twice before walking out of a shop even if you really-really liked something. Tip 3: Carry loose cash and change. Sometime the shopkeepers will just say they don’t have change. 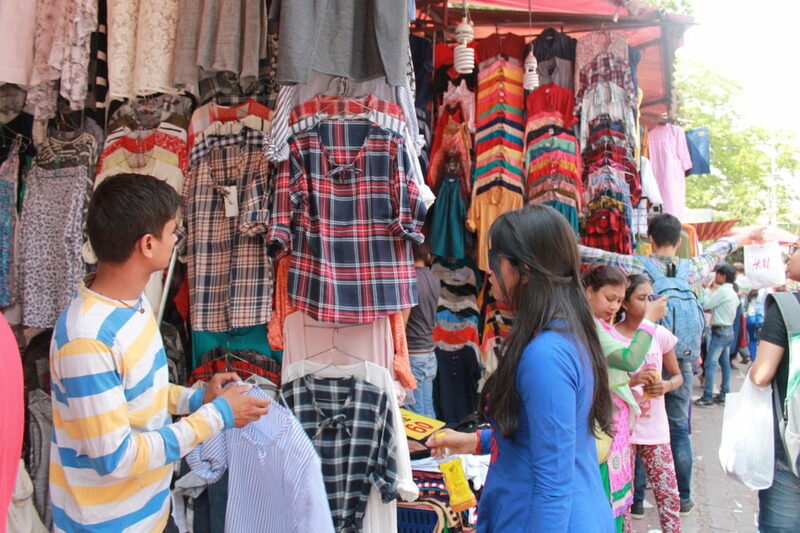 While sarojini market does have a variety for men, it is not comparable with women. Nay, not anywhere near to the collection for women. The quality of the clothes is decently good. They are the export rejects of known brands and have minor defects like missing button or torn from the inside. Do check all the clothes before you buy anything and spot the defect. That’s an extra bargaining chip, you know! Don’t ever be afraid to point out defects in the pieces you select, as you can negotiate a discount on your already bargained prices. Dress comfortably as you have to walk a lot and there are a lot of people around. I wore a white benetton shirt and pants with soles loafers. Below is the look! Carry a big bag along with you to stuff your shopping in it or buy one from sarojini itself. The shopkeerps there give you extremely thin plastic bags which tear off at a blink of an eye if you aren’t careful . Tip 4: Closed on Mondays. There are many eating joints inside the market. If your tummy can handle it, you can try them. Otherwise just avoid them and head on to DLF Square. It is right next to the market with options including Mc Donald’s, Haldiram’s, Subway, Dominos Pizza, Flaming Wok etc. Did you enjoy the post? Let me know in the comments or by sharing it on social media. I’d love to share travel hacks & tips, planners & checklists with you so feel free to subscribe for my free resource library. PrevPreviousFood Guide: where to eat in Gwalior?